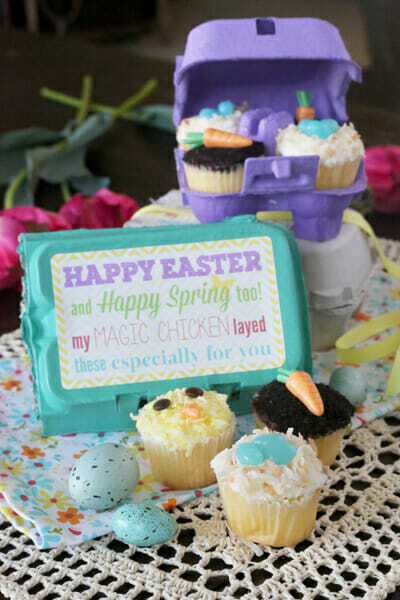 How seriously adorable are these Easter cupcakes and egg carton cupcake holders? I'm so in love!! 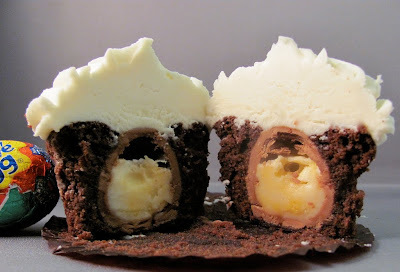 this super cute Easter idea. 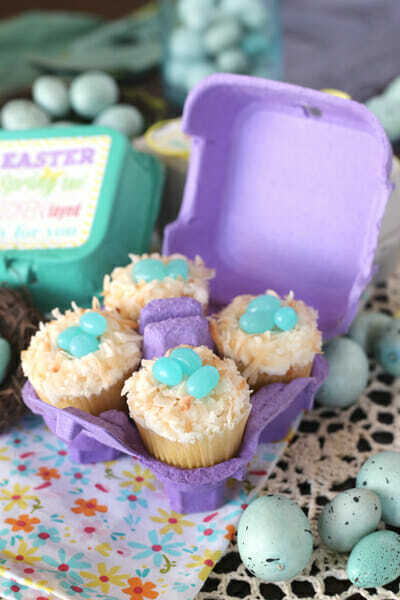 This blog post highlights three different Easter cupcake ideas, as well as directions for making the egg carton cupcake holder. 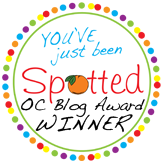 Hop over to Our Best Bites to check out the full post. Happy Easter everyone! As an early birthday present to my mom, I treated her to a night at the Cocoa Lounge at the Island Hotel in Newport Beach, CA. 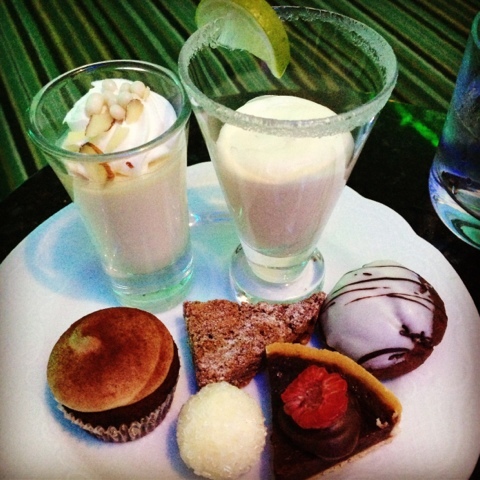 For only $18, you have access to an all-you-can-eat chocolate buffet. Amazing, right?! Just imagine a room full of delicious chocolatey treats, all yours for the taking. This was my second year of attendance, so I knew what to expect. I ate a small dinner before so I had plenty of room to indulge. 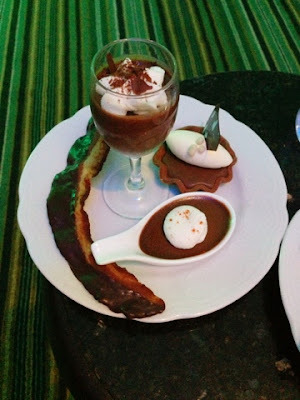 Round 1: At first I thought the chocolate-covered bacon was just for display because they were stood up in a flower vase. Maybe they were for display, but I took one anyway. Round 2 included several kinds of mousse too. I loved all the different ways you can incorporate chocolate (or white chocolate) into so many types of desserts: tarts, cake, cupcakes, mousse, cake balls, bars, cookies, etc. 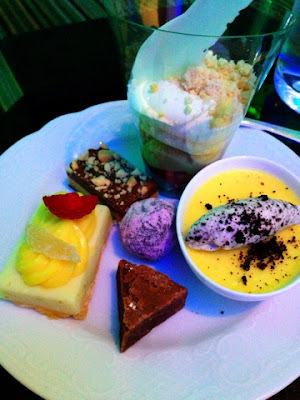 Round 3: The white chocolate lemon bar was my favorite of the night! 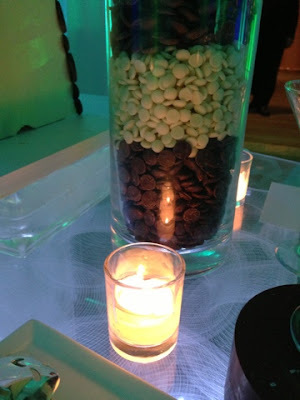 Normally I go for the real chocolate, but this dessert just had the right mixture of flavors. My mom and I were stuffed by the end of the night, but that didn't stop us from sneaking a few pieces of chocolate-covered bacon in our purses. What can I say?...it was the perfect snack when my stomach got some more room again. 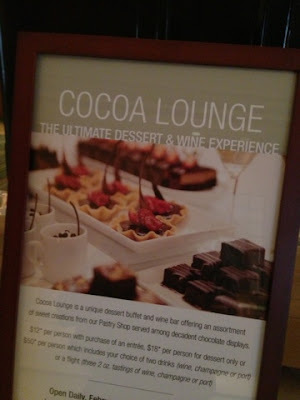 The Cocoa Lounge is open for two weeks every February. This was the fifth year of the event. I will definitely be attending at least once next year. I can't wait! Easter is sneaking up on me this year. I forget that sometimes it comes in March. I'm not prepared at all! Sometimes I need a break from cupcakes so that I don't get too overloaded. One of my favorite go-to easy-to-make desserts is Avalanche Bark. 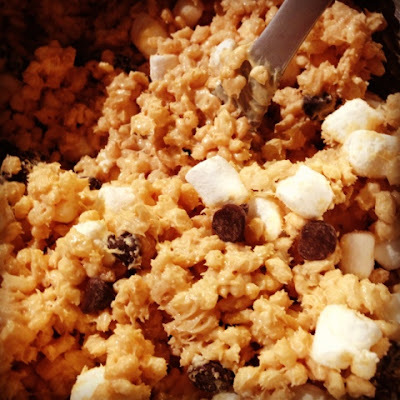 It's made with rice krispies, peanut butter, white chocolate chips, marshmallows, and semi-sweet chocolate chips. Drooling yet? You can find a link for the recipe here. This week's episode of Cupcake Wars featured four cupcake shops competing to win $10,000 and a chance to display at the Food & Wine Festival in Hawaii. I was super excited to see a local cupcake shop, Bubba Sweets, on this episode. I visited Bubba Sweets in Huntington Beach 16 months ago, a week before I had my baby. My friends threw me a surprise baby shower in Bubba Sweets! It was so cool! But before I had a chance to blog about it, along came Desmond and it got lost in the shuffle of newborn baby stuff. 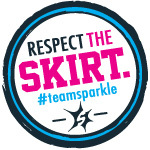 Now that they are famous and have won Cupcake Wars, I need to revisit and do an official cupcake review. I can't wait! Best Friends for Frosting posted a recipe for these Strawberry Milkshake Cupcakes using Magnolia Bakery's Vanilla cupcake recipe. The strawberry frosting recipe includes strawberry preserves, butter, and powdered sugar. They found the pink & white striped straws at an Asian supermarket. I would try Cost Plus World Market. These cupcakes are super cute! Have you Tried Icebox Cupcakes? Icebox cupcakes? This concept is new to me. 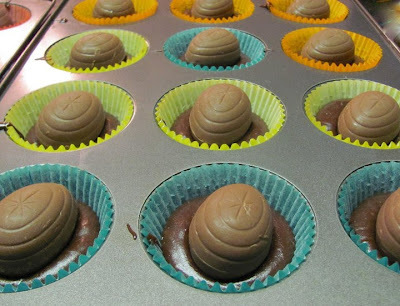 Two Peas and Their Pod posted a recipe for Chocolate Mint Icebox Cupcakes (which would be perfect for St. Patrick's Day). After reading the recipe I learned that icebox cupcakes are no-bake cupcakes made of layered cookies and frosting. Um...yummy! Why have I never seen these before?! Sounds like it's kitchen testing time! 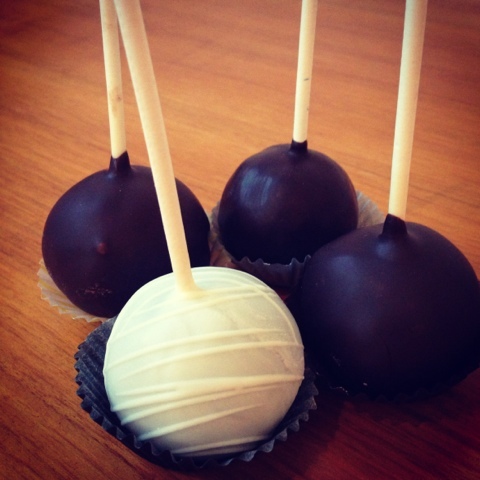 My husband surprised me the other night by bringing home some cake pops from Sweet and Saucy Shop. I don't know if he did it just for me or because he wanted some for himself. Either way, I benefited too! His favorite was Oreo and mine was Red Velvet. 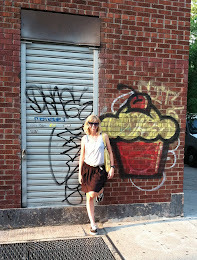 Why do all the great cupcake shops have to be so far away? I guess distance makes the heart grow fonder, right? Bake You Happy made their big debut on Cupcake Wars two years ago. And they won! (Check out my post-show interview here.) They used their prize money to open up shop in Valencia, CA in February 2011. Looks like business has been good because location #2 recently opened in Canyon Country. My friend happened to be in the area and picked up some goodies for me because she knows I LOVE Bake You Happy. The brown butter cupcake she brought me was out of this world, as knew the cookies too! Anyone want to pick up some cupcakes for me?! Yum! I'm starting to travel a lot more for my other job (the non-cupcake one). The good news is that it's giving me more opportunities to visit cupcake shops in places I've never been. So I need your help to tell me where I need to go. Next stop: Dallas in 2 weeks. Any recommendations? Candace and Florian are back to judge cupcakes. I was hoping I'd get a call for the job, but maybe next season. This first episode is about baking cupcakes for a VIP event at the San Diego Zoo. The first challenge even involves crickets. Hmmm...not sure about that one. Are you still watching? What is Cupcake Milk? I asked myself the same question when I saw Best Friends for Frosting's recent post title. My second thought was, "I wonder if this is similar to cereal milk from Momofuku Milk Bar?" Turns out my line of thinking was correct. Cupcake Milk was inspired by Cereal Milk. So how do you make this magical drink? 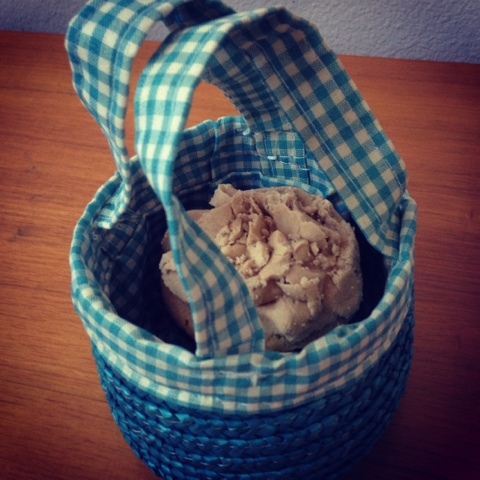 Well, Brooke from Sucre Shop posted the recipe on Best Friends for Frosting. It involves your favorite cupcake (duh! ), milk, and a French press (or strainer and cheesecloth). You can find all the instructions here. I think I'd drink a lot more milk if I had this kind in my fridge. I don't like shopping at large grocery stores because I end up buying foods I don't need. But in this case, it was a good thing. 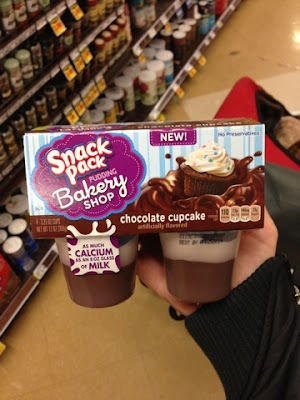 The other night I found these Chocolate Cupcake puddings from Snack Pack Bakery Shop. It's been a long time since I've eaten a pudding pack and they were as delicious as I remembered. I think the top layer was supposed to represent white frosting, but I just mixed it all around and enjoyed.